SV-GPS-2020 offer the lowest cost integrated glass panel system meeting FAA 2020 ADS-B Out requirements. The 7” SV-D600 and 10” SV-D900 displays are priced at $1850 and $3100, respectively. A complete 7” SkyView SE system with primary flight instruments starts at $3305 including harnesses. For only $2790 more, SkyView SE customers can add the SV-XPNDR-261 Mode S Transponder (with ADS-B Out) and SV-GPS-2020 GPS Receiver/Antenna. Aircraft so equipped will be completely compliant with the FAA’s upcoming ADS-B Out mandate. Download the SkyView SE Brochure for more information. Who should buy SkyView SE? SkyView SE is great for pilots that love the simplicity of Dynon’s legacy D100 series products but are looking ahead to 2020 and the ADS-B Out equipment mandates. If you fly an aircraft or mission that does not require complex mapping or navigation features, SkyView SE is ideal. SkyView SE is the lowest-cost way to equip with Dynon’s SkyView system, and it’s upgradeable to the full SkyView functionality in the future. What are the new part numbers and prices for SkyView SE displays? What are the differences between SkyView SE and buying a SkyView system without the MAP license and Synthetic Vision turned off? In addition the removal of the mapping capability, SkyView SE has a reduced set of features and capabilities to enable the most simplified and intuitive avionics flight experience ever for VFR pilots. Because of this streamlining of features, SkyView SE features almost no sub-menus. See the full list of product features for details. Can I buy a SkyView SE to add to my existing SkyView system? No. Because of the differences in features, SkyView and SkyView SE displays can not be connected together in the same aircraft. I have an EFIS-D100 / EMS-D120 / FlightDEK-D180 in my aircraft now. How easy is it to convert to SkyView SE? The SV-D600 (7”) display is slightly larger than the panel cutout for an D100 series product, so you will need to modify your panel. The engine monitoring connectors are largely the same and are virtually “plug and play”, but other harnesses and connectors are unique to SkyView. We have a manual available that discusses converting to a SkyView system. SkyView SE displays are exactly the same size and have the same mounting requirements as existing SkyView displays. What Autopilot capabilities does SkyView SE have? When equipped with servos, SkyView SE features a full-featured two axis autopilot with Dynon’s groundbreaking simplified controls. 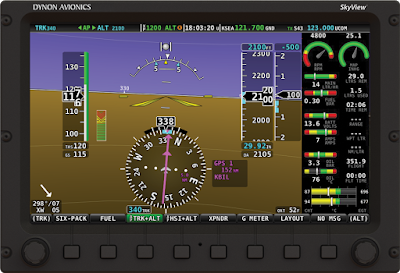 The autopilot can hold and change altitude, hold and change direction, and follow an external GPS source. It does not have IFR features like VNAV, IAS mode, or a flight director. To reduce menu complexity, there is no on-screen LEVEL button, but an external one can be connected (Dynon makes one especially for this purpose). The optional SV-AP-PANEL’s autopilot control buttons are unsupported by SkyView SE, although an SV-AP-PANEL can be installed behind the panel to provide Trim Controller and Autopilot Auto-Trim capabilities. Is SkyView SE 2020 compliant? Yes, with the installation of the SV-GPS-2020 and SV-XPNDR-261. I’ve already bought parts of my SkyView system (servos, ADAHRS, etc.). Will those work with SkyView SE? Yes, with the exception of products that are not not supported by SkyView SE, such as SV-ARINC-429, SV-ADSB-470, Wi-Fi Adapter, Video Input, External IFR Navigators, etc. See the complete feature and product list for details. I just bought my SkyView displays? Can I exchange them for SkyView SE displays (with the price difference as a refund)? Dynon does not currently offer downgrades or trade-ins to SkyView SE. Do you have any trade-in program from the D100 series of avionics? We do not currently have a trade-in program for the D100 series. Is Skyview SE available with Touch? No. 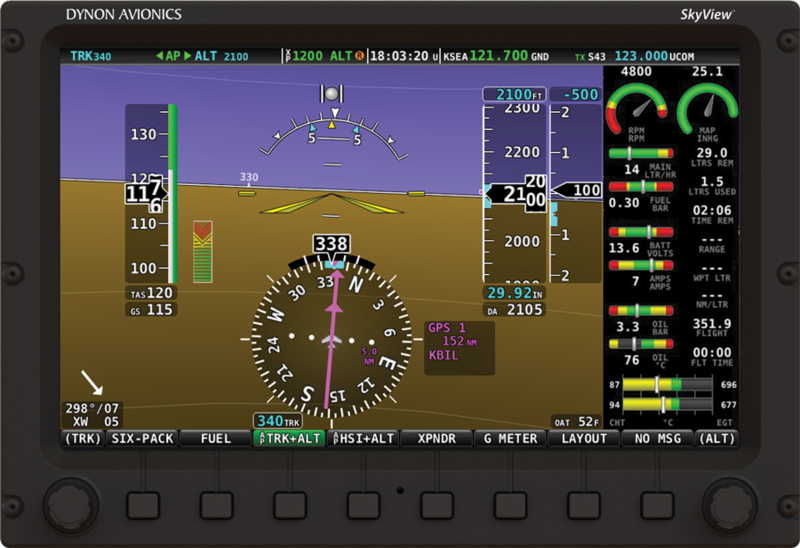 SkyView SE has almost no sub-menus, so most features, including autopilot, are available with a single button press. What about seeing traffic in SkyView SE? There are no mapping or synthetic vision capabilities in SkyView SE. Therefore, display of traffic is not supported. I already have a Garmin 430, but I like the feature set of SkyView SE. Is there any way to use the 430 with SkyView SE? No. SkyView SE does not support connection to the SV-ARINC-429 module, and therefore does not support IFR navigators. You can, however, display guidance from one NMEA-based GPS navigator (such as the x96 portable series) on the HSI. The Autopilot can also follow this guidance.